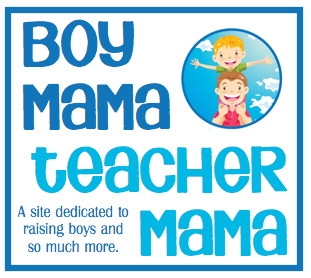 ← Boy Mama: Your Name in PAINT! I had no intention of writing about this. This project was just supposed to be one of those things the boys and I do together, snap a few pictures for the relatives and leave it at that. But, I was so moved by the whole experience that I just have to share it with you all. 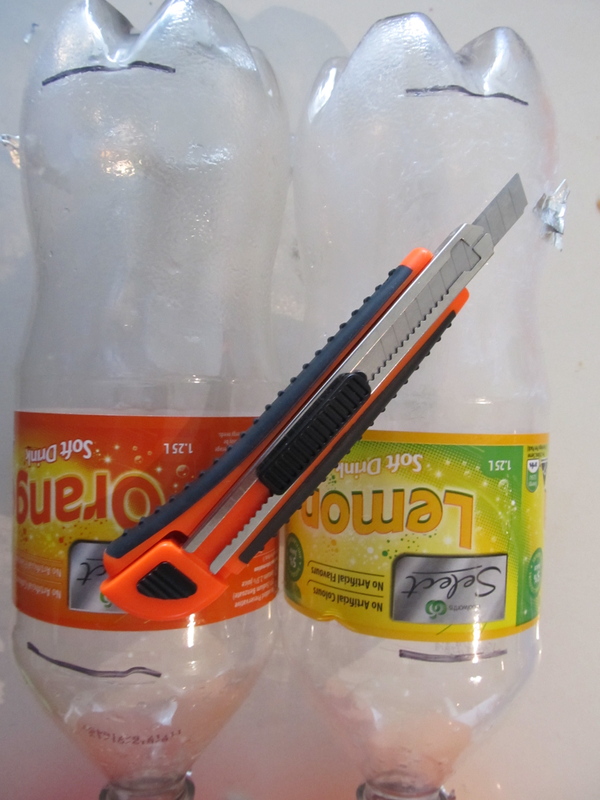 I had seen an idea for creating a jet pack from plastic bottles all over Pinterest and on various websites. We never drink soda or even juice in bottles, so I filed the idea away in the back of my brain and forgot about it. 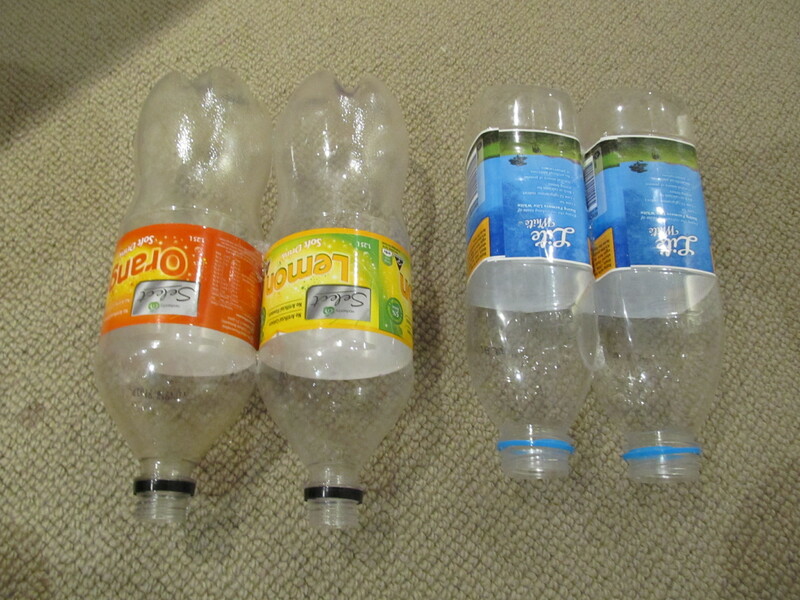 Well, over the last month or so, my boys have become very interested in space, rockets and the like and, we had a few plastic bottles left from our 4th of July celebration. I figured that the time was right. I told my boys about my idea and they were so excited. 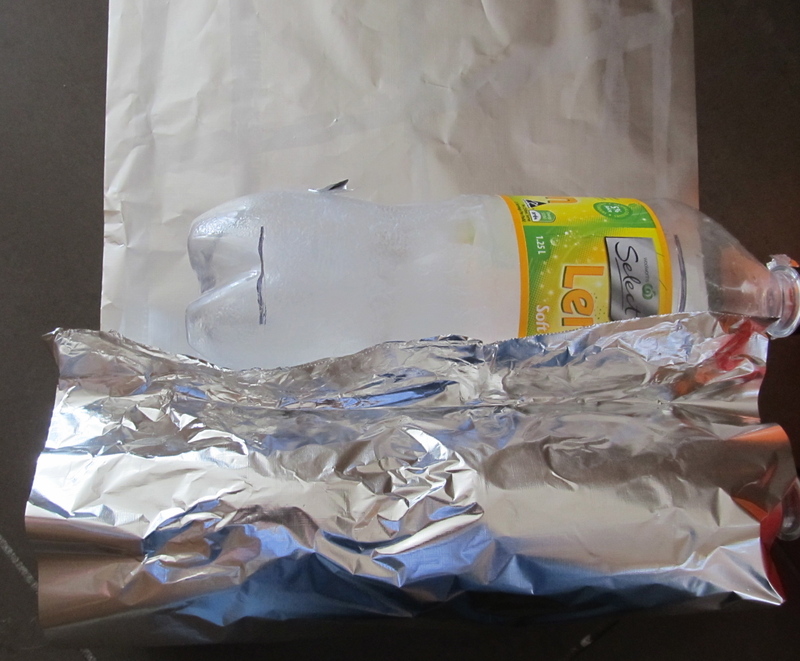 I pulled out the bottles, a roll of aluminium foil, a couple of balloons, a glue stick and my hot glue gun. 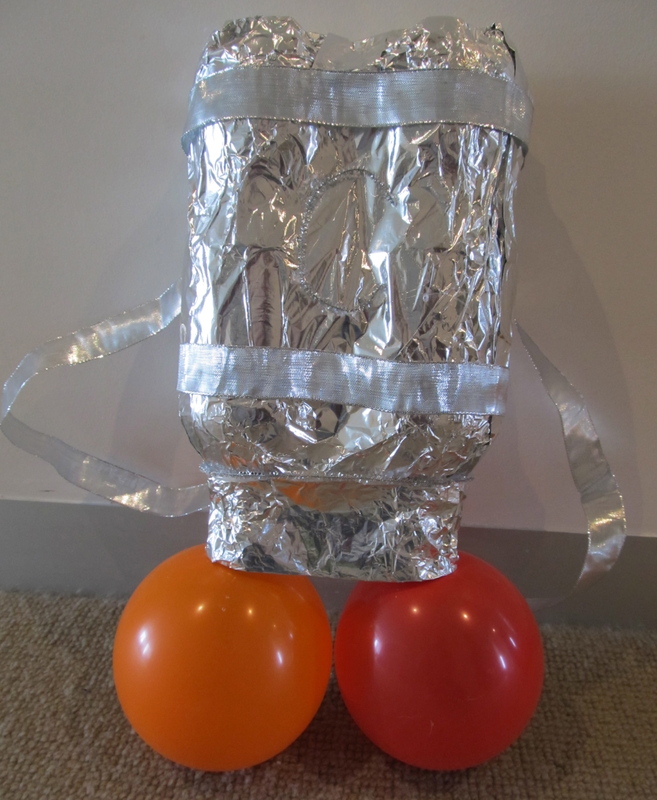 I created some very basic jet packs by hot gluing the bottles together and covering them with tin foil. I fashioned some straps from strips of tin foil and blew up a red and orange balloon for the fire. It was simple, quick and it worked. My littlest one was so excited while waiting for it he was literally shaking with anticipation. 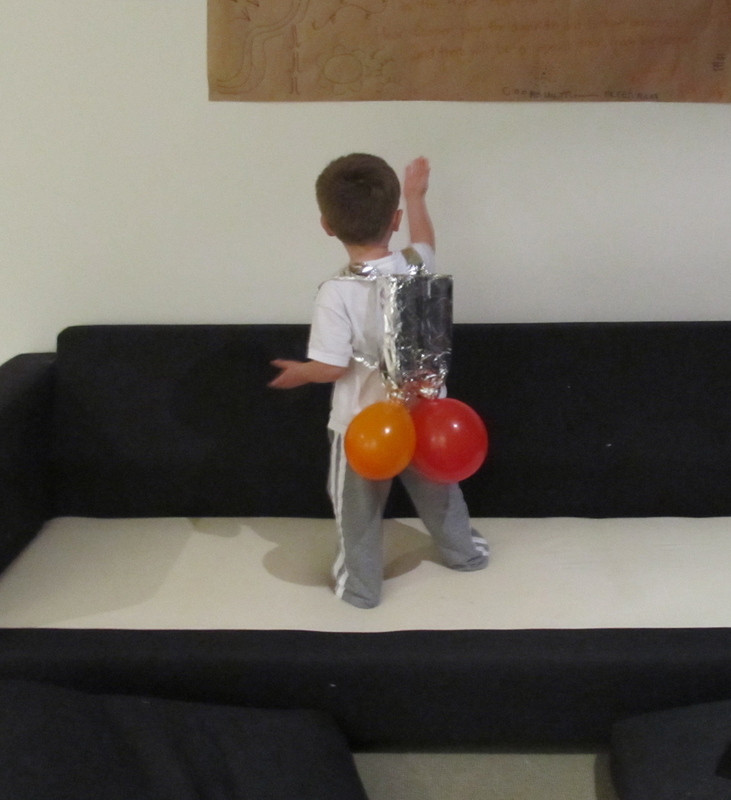 Then, we strapped the jet packs on the boys and they were off to play. This is the part that got me– the way the boys played TOGETHER. Their age difference of 2.5 years works at times and others does not. This time, however, everything just clicked. They were off and running. 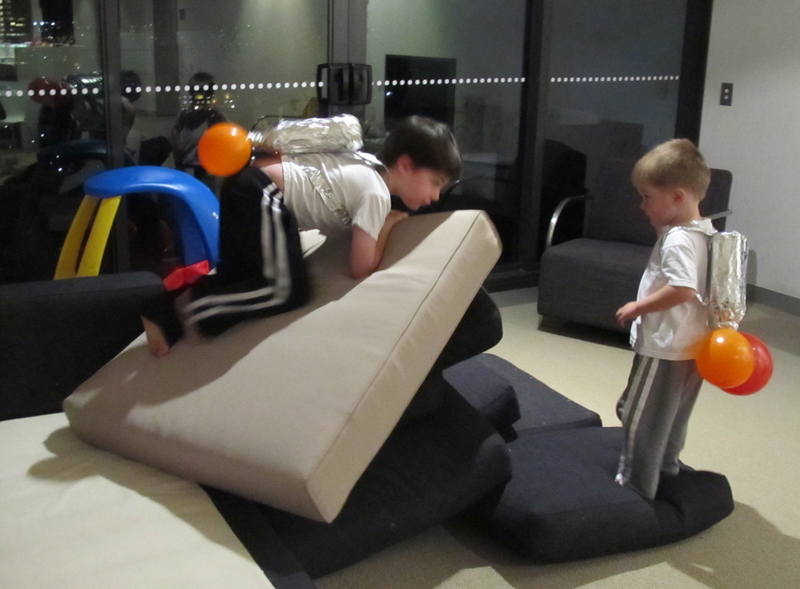 They created the moon from the couch pillows and “explored” the moon. They ran around the living room as if they were flying. They took their packs on and off and on and off. But best of all they did this all together , as buddies, as brothers. How wonderful is that? The first thing my youngest did this morning when he woke up was put on his jet pack and wait for his big brother to wake up to join him. Oh, man it was so hard for him to wait! When my eldest finally woke, he too put on his jet pack and they were off again. They played really nicely again, but the play was less focused and they were soon on to playing firefighters (their usual game) within about 10 minutes. 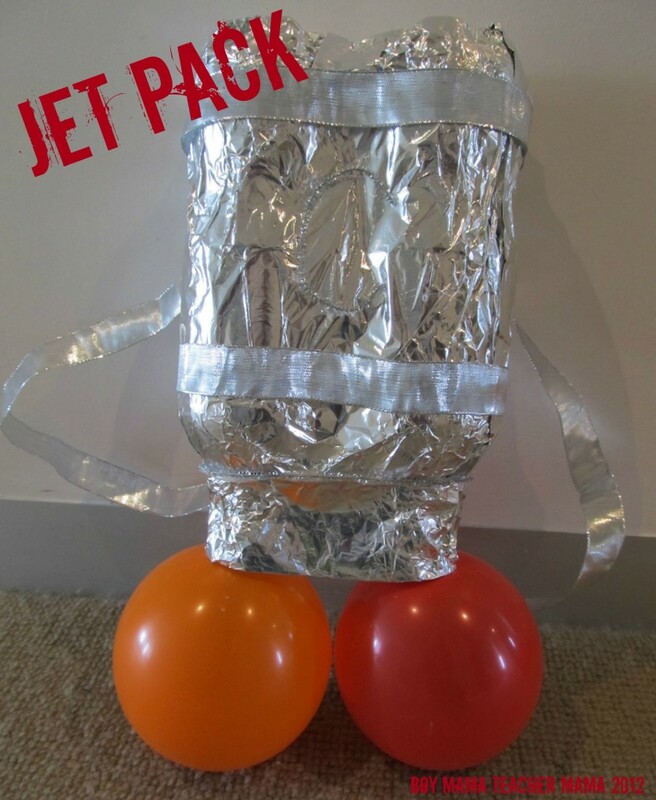 I decided that since the jet packs were such a hit that we would make a quick trip to the craft store to buy some ribbon for straps (the foil kept ripping) and maybe a few other bits to decorate them. Cut 2 strips of ribbon for the straps. Locate the slits you mades and slit the foil covering them, then insert one end of the ribbon in each hole. Straps should go up and down. If you like, cover the openings with ribbons with a bit of hot glue to keep them in place. Blow up one red and one orange balloon. Do not blow them up too much or they will not fit side by side. Creative DIY project. It is great to teach your kids do it. Hi Stephanie. I just posted a tutorial for the jet packs we made for R’s birthday party. I linked back to this post as another option for making these. I love your idea of using foil instead of painting the bottles and the balloons are such a great idea too. We are going to have to try this out! My oldest keeps telling us he wants to fly with a jet pack! 🙂 Thanks for this great idea! We’d love to invite you to join us at Saturday Show & Tell on Cheerios and Lattes! I know everyone will love your great kid-friendly ideas! Have a great weekend! 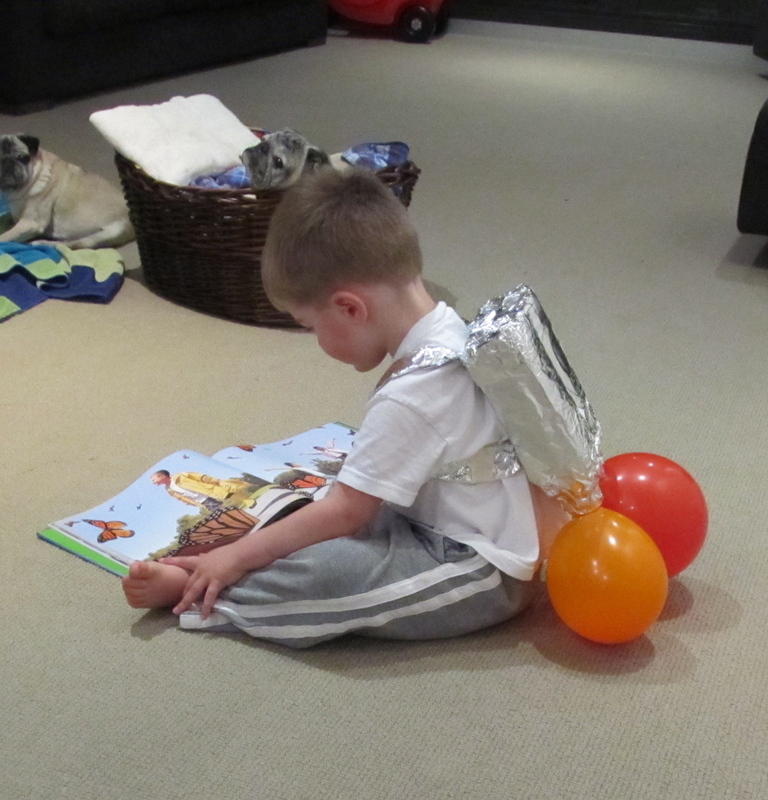 The picture of your youngest reading with his jet pack is too cute for words!! These turned out so great and your tutorial is brilliant. So clear and simple!